You are browsing the Blog for Finland, Estonia & Finno-Ugric Archives - Marja-Leena Rathje. Happy May Day Eve! Hauskaa Vappua! If you are in Finland many of you may have enjoyed bonfires on beaches, along with some sima and tippaleipää. In Germany, it’s Walpurgisnacht, in England there’s Maypole dancing. Here is one of many posts from my archives about this eve and day. Rather miss it here in Canada. 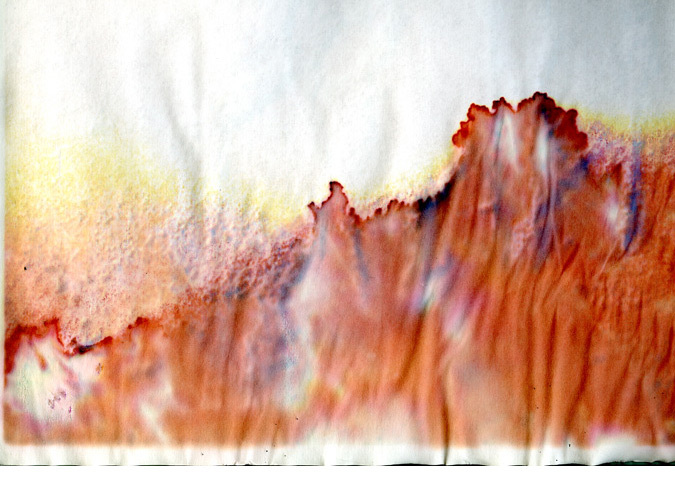 I have been playing in my little studio with offcuts of old print proofs, some of which had water damage that had resulted in some fascinating new patterns, bleeds, stains and even wrinkles, such as in the above image. It makes me think of those wonderful bonfires so thought to place this one here. The above is part of a poster about a wonderful event we attended on Sunday (Feb.8th) at the Scandinavian Centre in Burnaby. It was organized and presented by members of our local chapter of The Canadian Friends of Finland. Most interesting and educational was the talk and slide show about Sibelius’ early life, which is generally less well-known. Bob Poutt told us about Glenda Goss, an American musicologist who went to Finland to research Sibelius’ life and music, eventually publishing Sibelius: A Composer’s Life and the Awakening of Finland. She learned Finnish and became a professor at the Sibelius Academy in Helsinki. Somehow I had missed a lecture by Ms.Goss at the Centre in March, 2013. Mr. Poutt’s young grandsons acted out delightful scenes of a young Sibelius being interviewed by a reporter, set against a slide show. The audience was charmed. 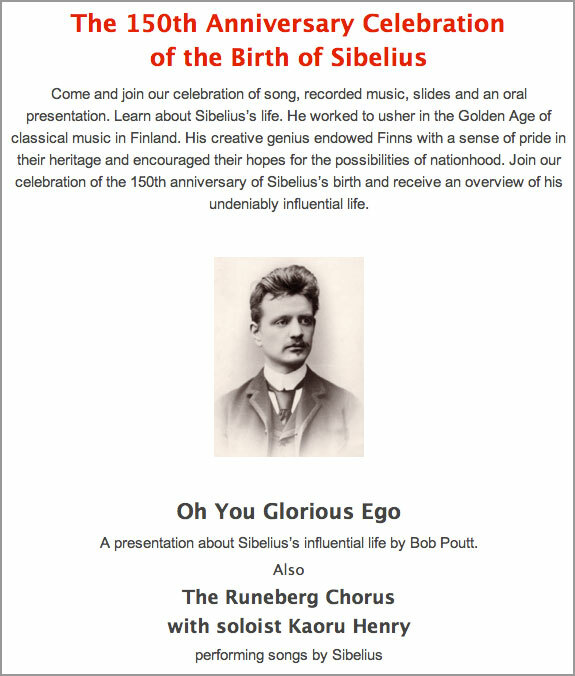 The Centre’s excellent long-running Runeberg Chorus performed many songs by Sibelius, in English, Finnish and Swedish (Sibelius’ first language). Two wonderful solos were the highlights, Diamond on the March Snow sung by tenor Yasushi Ishimura and Luonnotar by Kaoru Henry, each with glorious visuals on the background screen. Our favourite was the latter thanks to the singer’s professional operatic voice. Luonnotar is based on Finnish mythology, the words coming from the Kalevala. The text is from the first part of the Kalevala and deals with the creation of the world, Luonnotar is the Spirit of Nature and Mother of the Seas. It was a moving program and a wonderful afternoon of friendship as we were surprised by how many friends were there. Congratulations to all the organizers and performers! I wonder who did the superb visuals for the slide show? I am so inspired that I hope to get my hands on the book, in fact I put in a purchase request for it at our library. Jean Sibelius was part of a group of many artists, poets and writers who are all Finland’s greatest creators. This 150th Anniversary is being widely celebrated in Finland and beyond with numerous concerts, but only one that we know of here in Vancouver – we must request more. Of course there are many recordings available for purchase as well as online listening available, such as at Finland’s YLE Radio, where I’ve been slowly enjoying his seven symphonies. The first three highlighted on the page are performances by the Radio Symphony Orchestra, conducted by Sakari Oramo and presented in 2006 in Bergen, Norway. Just below these is a link to Symphonies 4 to 7, also by the above except for No. 5 performed in Helsinki. Enjoy! Yle also has a site Sibelius 150 mostly in Finnish but with some pages in English (scroll down). Even further down is also an audio interview of Glenda Goss in English. (I wish the individual articles were hyperlinked.) I’ve only just discovered this so will be busy reading these articles! I must also mention an excellent blog which I’ve been enjoying reading for some time. Dust of Hue is devoted entirely to Sibelius, written by a serious and knowledgeable fan who lives in Singapore I think. He has even visited Sibelius’ home Ainola. Finally, two related posts from my archives: Saariaho and Sibelius (with a photo of Ainola) and Sibelius…the Last Swan. My first language is Finnish but opportunities to speak it are now rare. Reading it at so many good blogs and news sites on the internet helps to keep me somewhat literate. One favourite place, though in English, is Books from Finland, ‘a journal of writing from and about Finland’. There are many differences between Finnish and English. Leaving aside for the moment the extraordinary disparity between Teutonic syntax and Finno-Ugrian syntax, the vocabulary alone puts you into a different climate and weather. Vowels are musical notes and Finnish is full of vowels. Consonants are noises – and English is full of consonants. Finnish words are all stressed on the first syllable. English words simply alternate stressed and unstressed syllables – and the word may begin with unstress or stress. Finnish lends itself to dactyls. Dactyls have never been much at home in English. Most English poetry is written in iambs, with trochees coming second, a few anapaestic poems, usually not very good; and not even Hiawatha, imitating the Kalevala, resorted to the dactyl. But Finnish words are all Finnish – either invented from existing roots or naturalised beyond recognition. Do read on if this subject interests you. Most of us know that the Finnish language is a difficult one for outsiders to learn so I have great respect for translators like Lomas and others who have mastered the language enough to note subtleties, especially in poetry. More articles by Herbert Lomas here and about him and his list of works here. Related posts on the Finnish language can be found in my archives under Linguistics. PS: I just noticed that Herbert Lomas also translated Troll: a love story by Finnish author Johanna Sinisalo, which I was ever so lucky to find in our local library and enjoyed reading. It is rare to find Finnish books here. 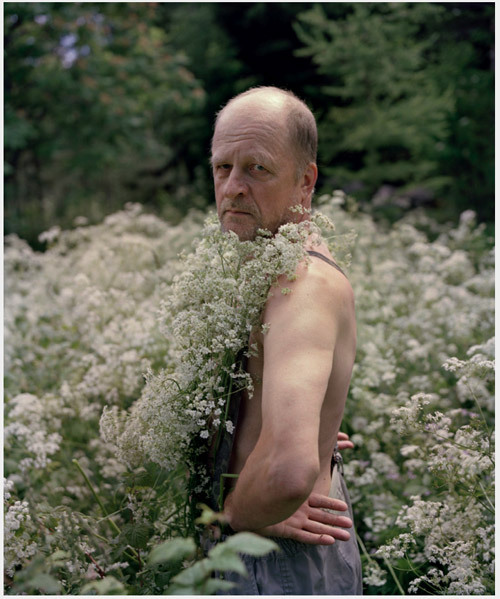 The first time I saw Eyes as Big as Plates and its many amazing photographs of elders set in nature, wearing materials from the earth, blending with the earth, sometimes half lost in moss or pond, I was completely stunned and awed by all of it. 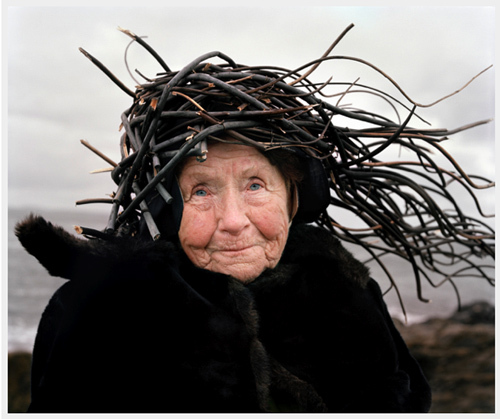 Learning that the artists are a Finn, Riitta Ikonen and a Norwegian, Karoline Hjorth explained a lot behind my feeling of a deep connection to the images – our Nordic roots, folklore and nature. Riitta and Karoline worked with volunteer elders in Finland, Norway, New York, France, Iceland and the Faroe Islands. (I must say the settings in Iceland are the most dramatic!) They captured a wonderful sense of beauty, wisdom, humour and love of adventure in these models in their various home places. This body of work has stayed with me as some of the most exciting I have seen. I have followed their blog since and now learned that they will have their first comprehensive solo exhibition of Eyes as Big as Plates in Oslo, opening January 23rd. How I wish I could be there to see the work and meet the artists! 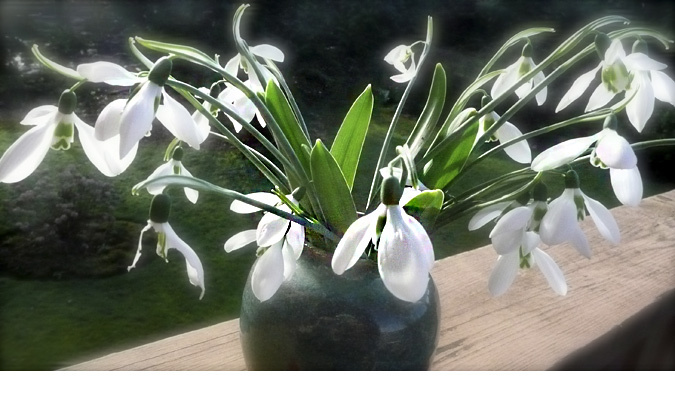 Many thanks to Riitta and Karoline for permission to use a couple of their photos. Congratulations on your stunning project and best wishes for your continuing successes! It would be wonderful if their exhibition were to come to Vancouver! 1. 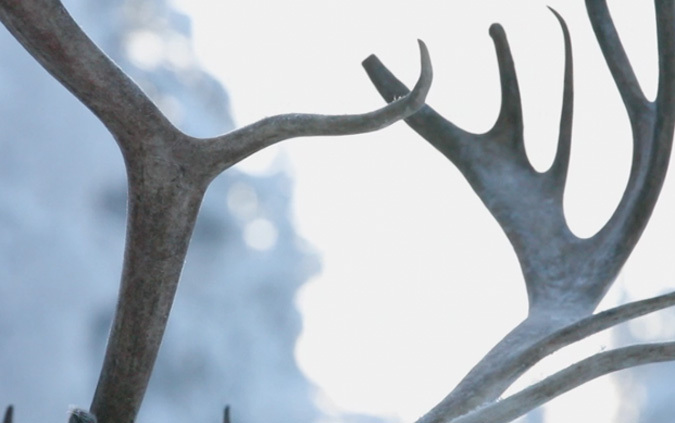 Living With Finland’s Reindeer Cowboys. Stunningly beautiful photography in this short video and in the film link to be found in the fascinating article. Image above is captured from here. 3. Santa lives in Finnish Lapland – a newspaper article from a few years ago that I’ve posted before and just came across again. Enjoy your preparations for the upcoming holidays! 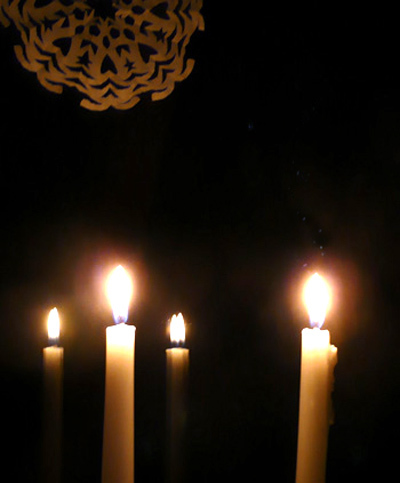 Two candles placed in the window of each home for Finland’s 96th Independence Day, is a long tradition on this day rooted in a time to remember and bring home safely the soldiers who freed Finland from Russia in 1917. The president of Finland even remembers Finnish expatriates in his speech on this day. Happy Independence Day to Finland and my Finnish readers! Two candles for a birth of a nation freed from another power. Two candles for honouring a man who fought for the rebirth of his nation and its people. Today I have thinking again about possible designs for this year’s Christmas cards. I usually like something red and something that has a bit of a story and is a bit personal. We have many weavings in our home, many were gifts to us or inherited from my mother. I thought I’d play with some scans of sections from a few of them. Above is one that came from Switzerland, I think. It is a reversible table runner. The other side has the red colour dominant. 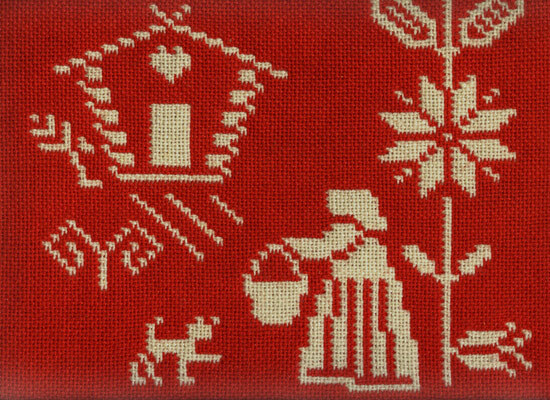 This one is a section from an old Finnish weaving that had been in my parents’ home as long as I can remember but I don’t recall who made it and gifted it. I would not be surprised if it came from a great-aunt who was an amazing weaver, but there are others in the family as well. 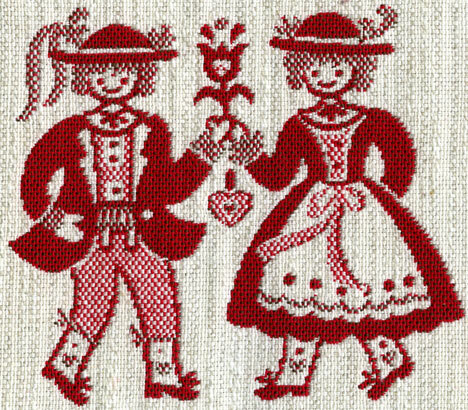 This is a small wall-hanging, also reversible, but with two layers, a very old traditional technique I believe. The design areas are woven together while the top edge is sewn together. The bottom edge has a fringe. To me, both of these are like children’s storybook illustrations. So, I then became inspired to try a card design with one of them – can you guess which one? I have been revisiting some of my husband’s photos taken inside the Sointula Museum. He only had his camera phone so unfortunately they are not very sharp. 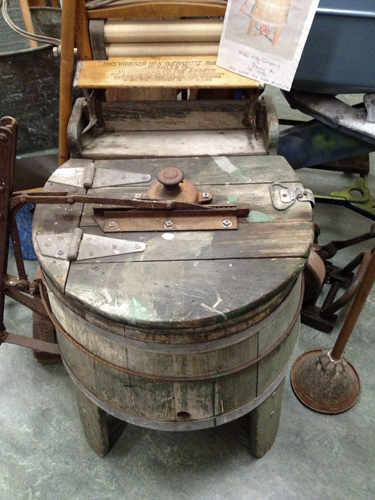 I’m quite intrigued by a couple of examples of very old technology. Telephones first came to Sointula January 23, 1956. 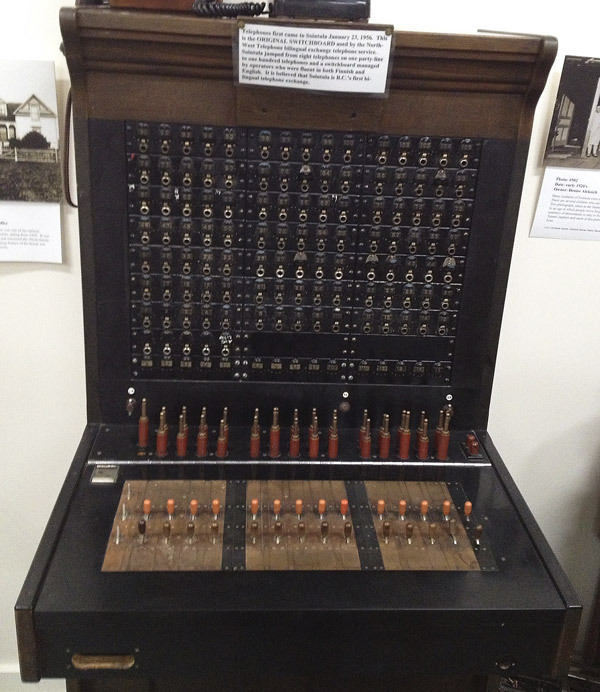 This is the ORIGINAL SWITCHBOARD used by the North-West Telephone bilingual exhange telephone service. Sointula jumped from eight telephones on one party-line to one hundred telphones and a switchboard managed by operators who were fluent in both Finnish and English. 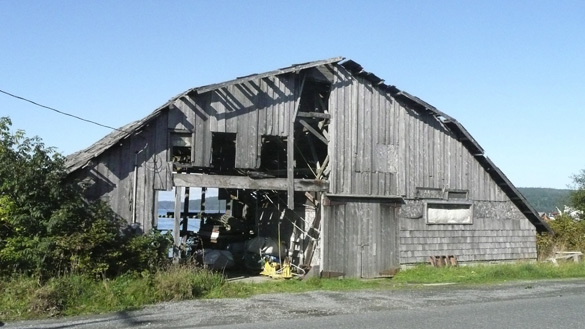 It is believed that Sointula is B.C.’s first bilingual telephone exchange. 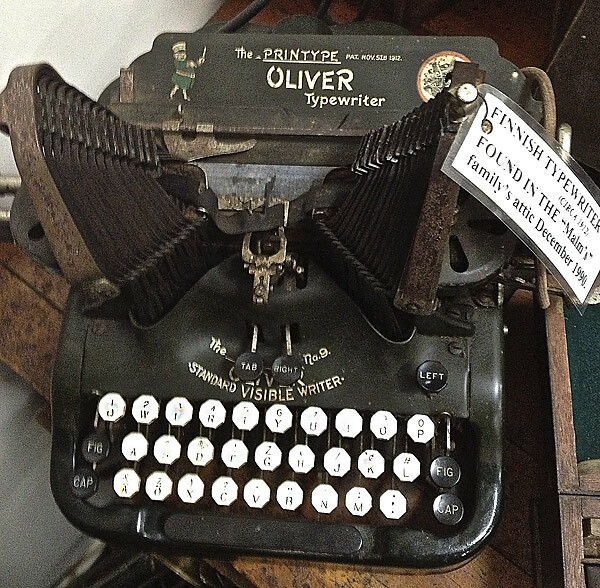 Below, as labelled, is a Finnish typewriter, patented 1912. I asked myself, does it have a Finnish keyboard? I blew up the image to try to read the worn out keys. I could tell it’s not our current English keyboard. With the help of a little photoshop sharpening, I think that the two lower left keys are an ä and ö, very important letters in the Finnish language. After our Quadra Island visit on day 2, we returned to Campbell River and headed north about 250 km. along a very good highway lined with forests, mountains, glimpses of lakes and ocean inlets but with very little population. Our destination was Port McNeill, but our accommodation was about a ten minutes drive beyond at a seaside campground, in a one bedroom log cabin. Though we knew that every cabin was full we were surprised by all the motorhomes and campers in the campsites. As we’d had great difficulty finding accommodation for four in town even a few weeks in advance, we surmised that there must be a lot of workers living in all the hotels, motels, and campgrounds in the area because of a lack of housing. We’d also been told that it was a popular fishing season for tourists as well. Anyway, the cabin though tiny was rather cute with a loft meant for kids (husband slept up there the second night because of our awful hide-a-bed). I enjoyed watching and hearing the sea birds along the estuary, and the view across to Malcolm Island, with its lighthouse. We actually spent little time here, only to sleep two nights and make our own breakfasts and packed lunches for our outings. Dinners in town were very good. Day Three was a full one with two very different destinations on two islands accessible by ferry from Port McNeill: Sointula on Malcolm Island and Alert Bay on Cormorant Island. I will write about Sointula first. Sointula has long interested me because of its early Finnish community. Sointula, Finnish for “place of harmony,” was settled by Finnish workers in the beginning of the 1900’s, as a co-operative community of utopian socialists led by Matti Kurikka. Eventually it failed with many Finns leaving for other parts of BC, yet many stayed. Some of their descendants are still living here. Please read more about their history here. After a little drive around the old village, we headed for the Sointula Museum which offers a unique educational experience. Its collection includes artifacts, publications and photographs specific to the development of this community from a Finnish socialist commune to the quiet village of today. The 100-year history of the settlement from its utopian beginnings involves the development of socialist thought in Canada and the building of the commercial fishing industry, unions and cooperative economic structures. At the museum we met Sue, the lively and informative manager with whom I spent most of our time there chatting. She said this building was the former schoolhouse which she’d attended as a child. The teacher was her English mother and she had a Finnish father. The museum is full of old objects from the lives of the islanders. I barely had time to see it all while husband and our visitors did. 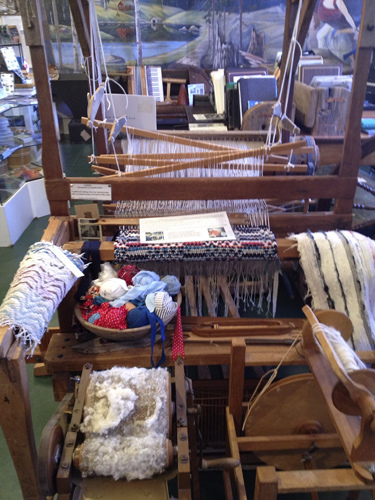 I especially loved the loom, so like the one we had in our home on loan for a few years when I was in my late teens. My mother wove a few things, I made a rag rug now long worn out. As Sue said, most visitors find many of the admittedly worn and shabby things brought back memories of our elders. I don’t mean to be unkind, but I believe the museum really does need a lot of help and perhaps more space in organizing things in a more presentable way for it seemed too much like a junk shop. It must be difficult to find that help in this tiny remote village. For me, the personal contact with Sue was most heartwarming. Because this was Monday, the bakery in town was closed to my husband’s extreme disappointment for he had been looking forward to some Finnish pulla. The Co-op store, the first of its kind in Canada was also closed. We went for a drive around the island, passing some newer homes and marinas, signs of perhaps vacation or retirement homes in some cases. 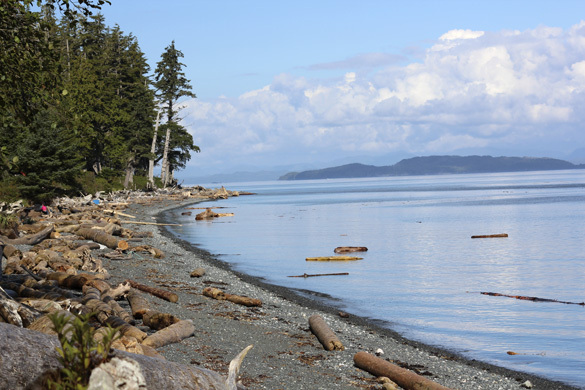 On the east side of the island is a large campground and lovely views east to mainland BC. Sointula was preparing for an exciting conference just a week or so later, called Culture Shock: Utopian Dreams, Hard Realities. And most exciting was that a Finnish musical theatre group was coming! Do check out this link to an excellent story and video by CBC. Wish I could have been there. More about Sointula in Crawford Kilian’s articles in the Tyee : In Sointula, Survival of the Finnish, Radical Finns Persevere off BC coast. And Kilian’s own blog called Sointula. Added November 1st: After Jean mentioned a Finnish Utopian society in Brazil in comments in another post, I searched and found a list of Finnish Utopian communes around the world – fascinating. Sointula seems to have had the largest population except for one in Karelia, next door to Finland. Added November 4th: I have only recently come across the blog associated with the Suomi-Seura organization for Finnish expatriates to which I belong. It is called Kotisi Mailmalla (Your Home in the World). 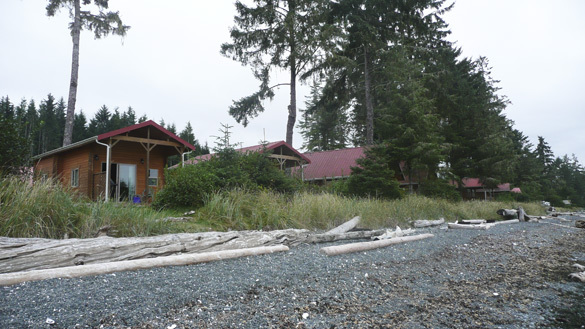 In it is a wonderful post about one person’s weekend visit to Sointula’s Utopia conference. In Finnish only, sorry. Hauskaa Juhannusta! Wishing I were in Finland to celebrate and enjoy the magical white nights at lakeside family cottages with bonfires and saunas! 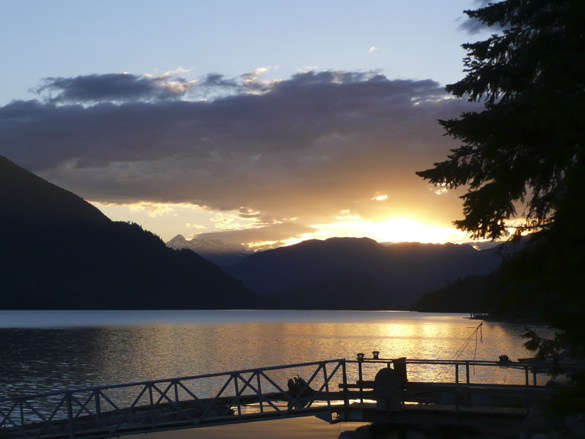 This photo was taken at Lillooet Lake, BC just after 8 pm on June 16th where we stayed at a lovely bed-and-breakfast home. More about that trip later.